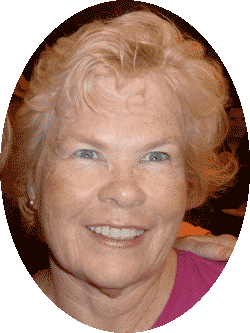 ALL information related to the proposed resort development on Water Island will be posted on this page of the Water Island Civic Association website. Bookmark this page and check back often for the latest information and updates. Governor de Jongh is pleased to announce the signing of the lease for a boutique hotel development on the former hotel properties as a result of the Expression of Interest advertised September 2013. The full scope of development is outlined in the document entitled, “Executive Summary” which was provided by the developers, Water Island Development Company (WIDC). The developer was asked to reach out directly to the residents as well. The Lease Document and accompanying exhibits were sent to the Legislature late last evening. The documents include the Governor’s transmittal and press release. The next step for the lease process is to be heard in the Committee on Finance at the Legislature, which will be scheduled by the Chairman, Senator Clifford Graham. Once the Committee on Finance schedules the meeting, any documents, exhibits, or testimony related to the lease should be put in a folder on the Legislature’s website, http://www.legvi.org/. Go to the link for “Committee Meetings”, go to the link for “Committee on Finance”, and they will be listed under whatever day the meeting is scheduled for. Ms. Lisa Melchior in Senator Graham’s office manages the committee meetings for the Committee on Finance and may be able to answer any questions about that hearing process. 774-0880. On behalf of Governor de Jongh, if I may be of any assistance, please contact me. Posted November 20, 2014 The below email was received from the Water Island Development, LLC and we were asked to distribute it. Water Island Development, LLC and the Government of the USVI have concluded lease negotiations and signed a lease for redevelopment of approximately 40 acres on Water Island. The lease signing occurred yesterday at 9 am. Water Island Development, LLC (WIDC) was selected by the USVI Government, through a rigorous public selection process, as the Developer for the 40 acre site owned by the Territory. 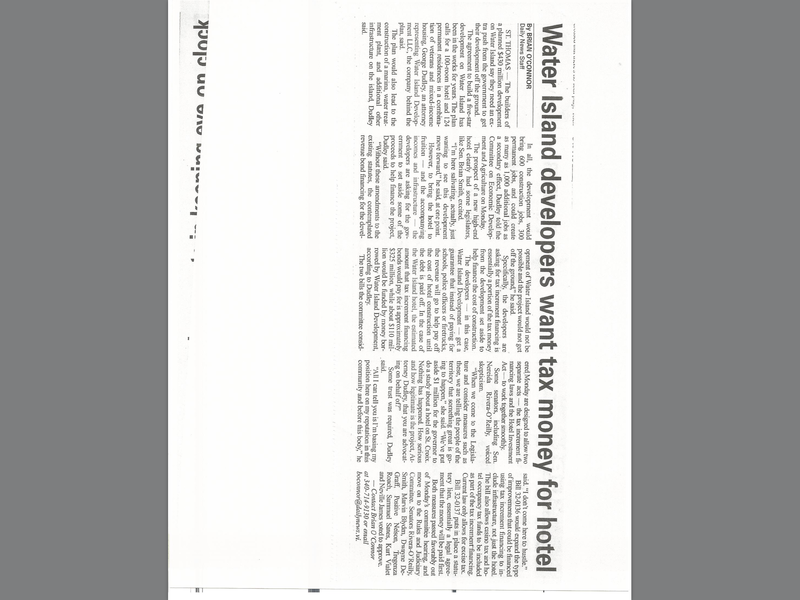 Redevelopment of a hotel on Water Island was stipulated as a condition for transfer of Water Island land from the US Department of the Interior to the USVI in 1996. The development site includes Flamingo Bay, Honeymoon Beach and the site of the former Sugarbird Hotel, destroyed by Hurricane Hugo and subsequently closed. The development is the result of an aggressive program of economic development undertaken by the USVI Government to encourage new sources of tourism based revenue and job creation. 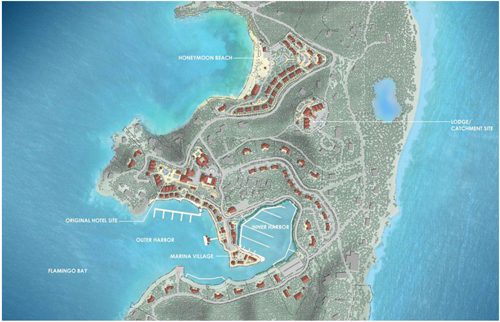 The Water Island Hotel will be the first new hotel developed in the USVI in almost two decades. WIDC intends to establish a unique, eco-sensitive, five star hotel and marina on Water Island. WIDC has assembled a development team of internationally recognized experts led by Michael Graves. Michael Graves is one of the most iconic and revered architects in the world today, and is especially recognized for his pioneering of eco- friendly and sustainable living design concepts. The WIDC development team includes Development professionals with a long history of successful development in the USVI and a focus on local hiring. Our first act, now that we are recognized as the designated developer for rebuilding a Water Island Hotel and Marina, is to reach out to the Water Island community. We would like to invite you to visit our private website to preview our concept for the hotel and marina, including PRELIMINARY Conceptual Development Plans. The plans will evolve over coming months as we carefully consider input from community stakeholders, government agencies, investors and hotel operators. The final development plan will be a thoughtful and environmentally sound plan that brings a new era of style, grace and comfort to Water Island. The firm’s next steps will include meetings with USVI community stakeholders, to be scheduled early next year. The meetings will include Water Island residents and elected officials. Conceptual development plans are currently being refined. A key factor in WIDC's approach is community engagement and preservation of the unique qualities that make Water Island such a special destination, including golf cart transportation and public access to Honeymoon Beach and Flamingo Bay. Last night, as President of the Civic Association, I received an invitation to attend the signing of the lease agreement between the Water Island Development, LLC (proposed Water island hotel developers) and the U.S. Virgin Islands Government at the Government House this morning at 9AM. In spite of the small group attending, it was done very well. There were brochures handed out and the main attendees were those in Government who worked on the project as well as some private members of the committee who worked on the EOI or Selection Committee. I thought it was nice recognition for the Water Island Civic Association to be included in the small invitation list and it was appreciated. In fact, at the time of the signing, I was asked to stand with those signing the lease along with Lisa Hamiltion, the President of the St. Thomas Hotel and Tourism Association, and Colette Monroe, who is on the committee as the Governor’s Policy Advisor and a Water Islander. It was explained that this is only the first step of the process, which is why we have not received any real information during the process so far. It was described as ‘the beginning of the beginning’ of the steps needed to bring it to the legislature for approval. We should start seeing some proposals and ideas going forward. WICA has received a commitment from all, starting with the Governor at the EOI meeting, that we will be involved. As we get information in from the various groups, we will share them immediately as we have done so up to now. The next step for WICA is to help coordinate the Town Meeting which the project team wants to hold as soon as the legislature reviews the lease and votes on it. We expect the Town Meeting will take place some time in January when specifics are known.